On the eve of the bullfight, the bulls are driven by the herdsmen from the enclosure in the Rochapea to the pens in Santo Domingo, from where the bull running will start on the following day. This is the so-called Encierrillo or short bull run and, although it is not included in the official program, the event is getting an increasing number of spectators. 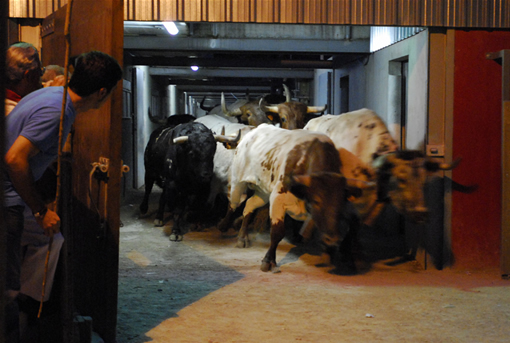 Aficionados watch in silence from behind the barrier as the six bulls to be fought the next day, run along the route. Until the 19th century, the bulls brought to the city for the fiestas were left to pasture for a few days in the area known as Soto de Esquíroz, relatively distant from the centre. At dawn the bulls were then taken to the meadows of San Roque (Cuesta de la Reina) along what are today the streets of Fuente del Hierro and Vuelta del Castillo. The need to shorten this route made it necessary to divide the bull run into two sections: the first would be the Encierrillo or short bull run, to take the herd as far as the present-day Cuesta de la Reina, and a second section corresponded to the bull running route. The demographic growth of Pamplona at the end of the 19th century, combined with the fact that in 1898 the bulls managed to escape when being transferred to the bull pen, led to the introduction of safety measures. From the following year onwards, the Encierrillo was held as we know it today. 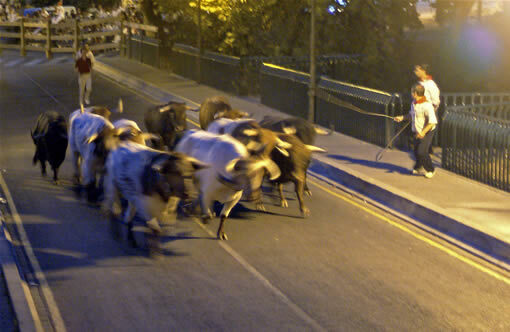 Shortly before 11 pm, the head of the Municipal Police, with the support of a group of policemen, gives the order to clear the route, whilst the head herdsman indicates where each herdsman should position himself. The bugle is blown to indicate that everything is ready at the Santo Domingo pen. On the Rochapea bridge, a policeman responds with another bugle note to indicate that the route up to the pens is clear. This is the moment when the herd of bulls comes running out, driven on by the herdsmen, towards the pen of Santo Domingo. 440 metres lie between the two enclosures. The act ends when a policeman confirms that the bulls have entered the stalls. To watch this event, you need to have a personal pass from the Council, this can either be obtained from the Information Office on the ground floor of the Town Hall or, during the San Fermin fiestas, in the "Informe-bus" office located in the Plaza del Castillo square. However, it is forbidden to enter the pens or to access the route, except for duly authorised technical personnel with visible identification; these people are responsible for the fencing, doors and cattle and, in short, for the correct organisation of the short bull run. Spectators can only access the public areas and must remain in silence whilst the bulls are being transferred to the pen. It is not permitted to take photos with flashes, so as not to distract the herd.